A registry problem was detected. This can occur when more than one service is defined for a device, if there is a failure opening the service registry entry, or if the driver name cannot be obtained from the service registry entry. Click Uninstall, and then click Scan for hardware changes to load a usable driver. Restart the computer in Safe Mode, and then select Last Known Good Configuration. This rolls back to the most recent successful registry configuration. Click Start, type regedit in the Start Search box, and then click regedit in the Programs list. There can be many instances of the registry subkey that is mentioned in step 3. You must make sure that you are in the appropriate registry subkey before you change the UpperFilters and the LowerFilters values. To verify that you are in the appropriate registry subkey, make sure that the Default value is DVD/CD-ROM and the Class value is CDROM. Many of the comments imply this file and service comes with iTunes. Sure enough, I had just un-installed of iTunes 11 and the done a fall-back install of iTunes 10.7 (due to the fact they broke drag-and-drop). I removed the filter and then remove/added each drive in turn. The drives returned like normal and the system returned to full performance. Thanks again Apple – for your cr*ppy iTunes software. One of the (frankly) terrible aspects of doing Android development is the horrendously slow Android emulator. This is especially true if you do OpenGL ES development. Fear not! Intel has come to the rescue. They’ve released HAXM (Hardware Accelerated Execution Manager) that dramatically speeds up your Android development and emulation. Best part is that it’s free. The amount of time you’ll save on app start up alone makes it worth every moment you’ll spend setting it up. 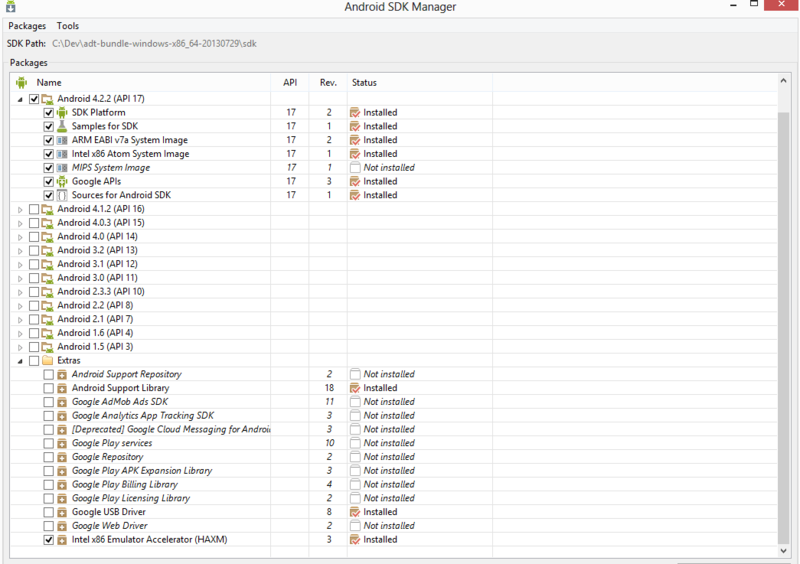 Open the Eclipse SDK Manager. The API level MUST INCLUDE AN INTEL X86 ATOM SYSTEM IMAGE (API 17 at the time of this writing). After those packages are all installed, close the manager and open Eclipse. I named mine Standard_Run_Configuration – but you can name yours whatever. Select the ‘Automatically pick compatible device…” option, then select the ‘Manager’ button. 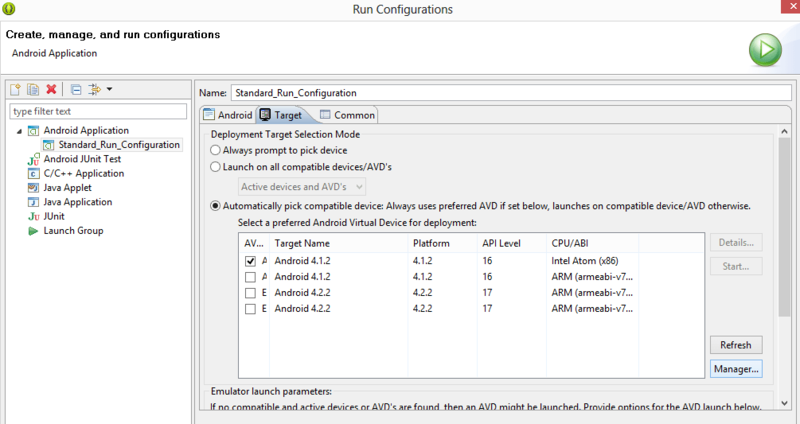 You should see your new AVD listed when you’re back at the Android Virtual Device Manager page. To test it, select it from the list and then press the ‘Start…’ button. 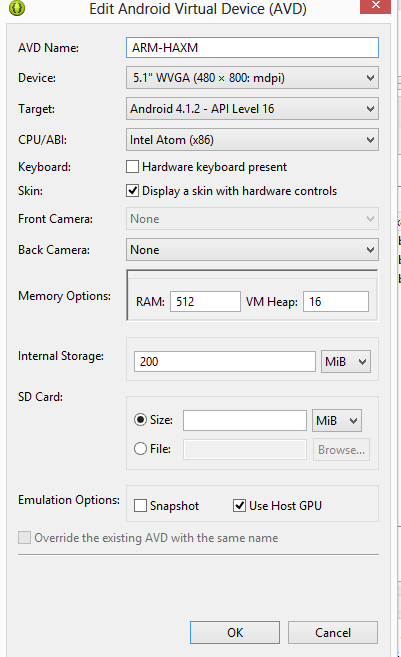 If all goes well, you should have your hardware accelerated AVD emulator. You should notice that the emulator runs orders of magnitude faster than the standard emulator! I had the problem where this message appeared when I tried to run the emulator. Close Eclipse and Eclipse SDK manager, but still make sure you’ve got the Extras->HAXM installed in the Eclipse SDK Manager (as you did in step 3 above). Run the install package to the normal locations. Restart Eclipse and see if you can run the emulator via going to ‘Run’->’Run configurations’. This time it worked for me. You should see something like this from the message window if your HAXM is running in hardware accelerated mode.